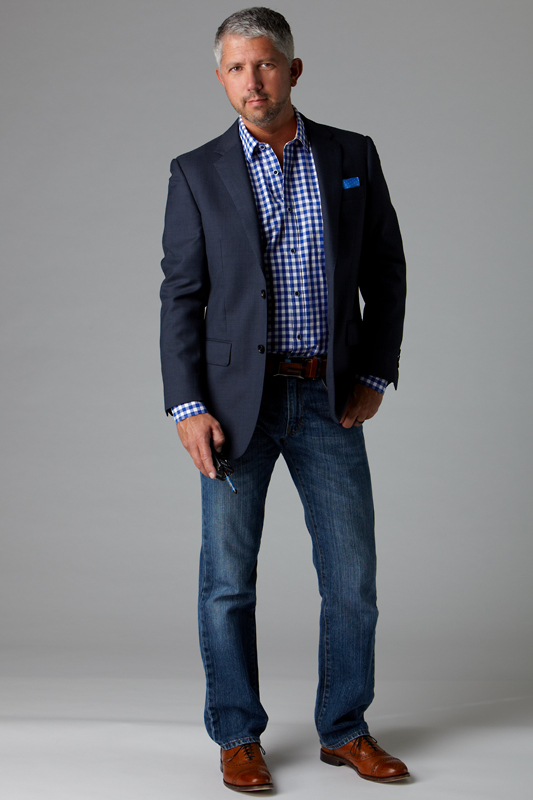 Dark wash jeans are one of the most versatile items of clothing you can own. They can easily go from ultra casual to dressy with just a few simple changes. I’m all about being comfortable, and jeans are definitely one of my go-to items when I want to step up from casual. Here’s a few examples of how I dress up a pair of jeans. Firstly, shoes. 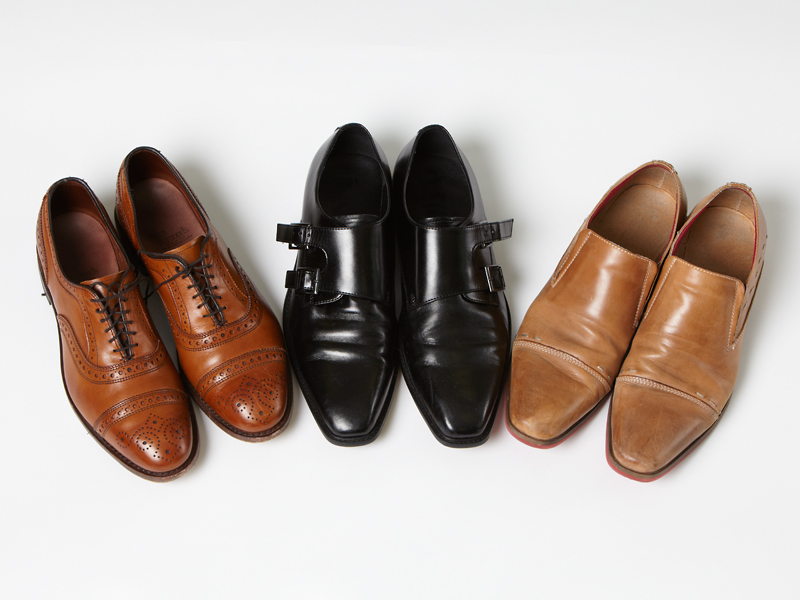 I’ll show three different shoe options from casual slip-on to dressy double monk strap. For a casual look with a t-shirt, ditch the athletic shoes and go for a pair of simple slip-on driving mocks or loafers. 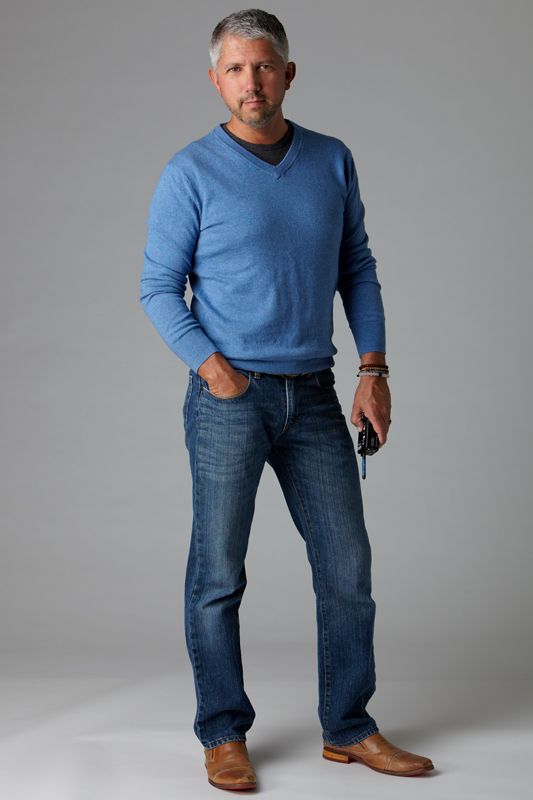 From there, if you want to step it up slightly more, go with a fitted v-neck sweater over a crew-neck t-shirt. Next, we’re switching out the tan shoes for darker brown brogues. Go for a fitted button-up with a casual pattern. 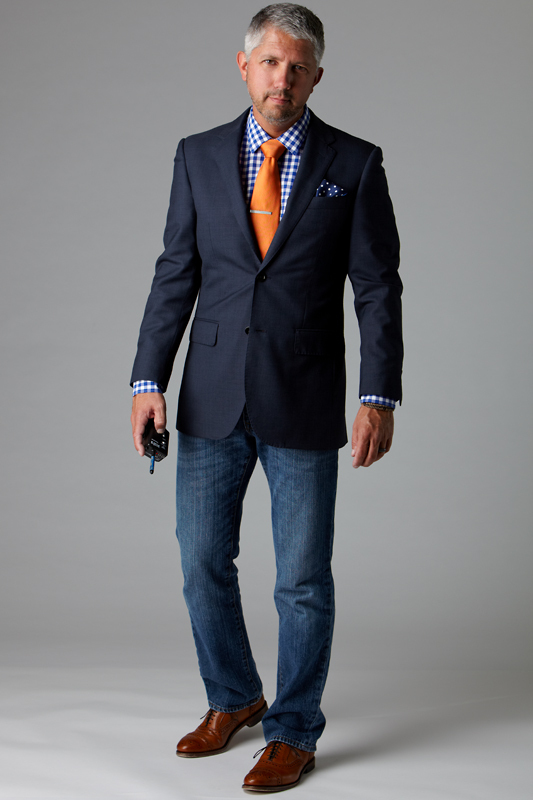 If you’re heading out, throw on a navy sport jacket. If you want to wear a tie without coming off too stuffy, go with a sweater. It’s a great look for fall when the weather cools off. You can put the jacket back on for a nice, sharp look. Finally, we’re going dressy. We’ve gone for a pair of black dress shoes and a solid white dress shirt. Going with the same jacket, you can see how the crisp white shirt and black shoes elevates things a bit. Throw on a tie and you’re in business. You’re still rocking jeans so you still have the casual attitude without being too over-dressed. I just came across your blog tonight while I was searching for new jeans for my husband. I love this post and the jeans that you are wearing. Could you please share what brand they are? Thank you in advance. I look forward to following your blog! Hi Karen, thanks for your comment! If I’m not mistaken, these are Banana Republic jeans. They have several different cuts and the fabric is high quality. What brand of shoes are those tan casual slip ons from the picture above? Thx. Hi Mike, I bought those a while ago and no longer have them, but if I remember correctly, they’re Stacy Adams.